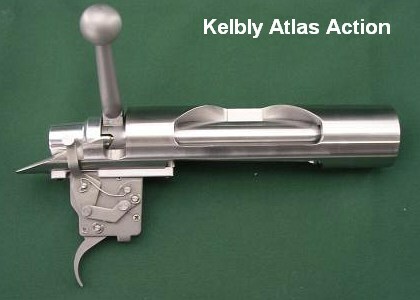 Kelbly’s Inc., just annouced that it will produce a new, stainless Rem-clone “Atlas” action that will sell for $700.00 (before options). Notably, it is available with a cone bolt and a trigger hanger. The latter feature means that glue-in installation is feasible. Additionally, a headspace adapter will be offered so you can use chambered barrels that have been headspaced for Kelbly Panda actions. Currently, only two configurations will be offered: right bolt, right port (RBRP), or left bolt, left port (LBLP). The first run of Atlas actions are slated for release at end of October 2009. The new action is named after the Atlas Bear, once found in Morocco’s Atlas mountains. 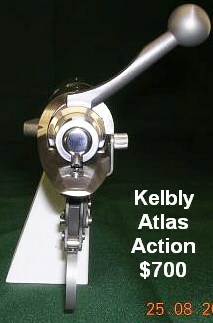 To learn more about the new Atlas action, call Kelbly’s at (330) 683-4674. Share the post "Kelbly's New Atlas Rem 700-clone Action"
Ruger has just announced the new SR-22, which is a Ruger 10/22 shamelessly tarted up to look like an AR-15. For tactical and 3-gun competitors needing a practice weapon that shares the ergonomics of their AR15 match gun, the SR-22 makes sense. Otherwise, frankly, we lament the addition of the wobbly and poorly-designed AR-style collapsible stock to a firearm that works just fine with a conventional stock. We do like the integrated Picatinny-style rail on top of the action. This allows you to easily mount Red Dot sights or other optics. But does anyone really need rails on the forearm or a Mini-14 flash suppressor on a 22LR? No, but these features will probably sell more rifles. Anything that looks “tacticool” these days seems to sell well. MSRP for the new SR-22 is $625.00 and we expect street price to be about $575.00. That’s more than twice the price of a standard 10/22 that, frankly, performs pretty well once you’ve upgraded the trigger. Is it worth paying double to get a pistol grip, AR-style buttstock, and Picatinny scope rail? Ruger is banking on the fact that AR devotees will say yes and shell out big bucks for the SR-22. 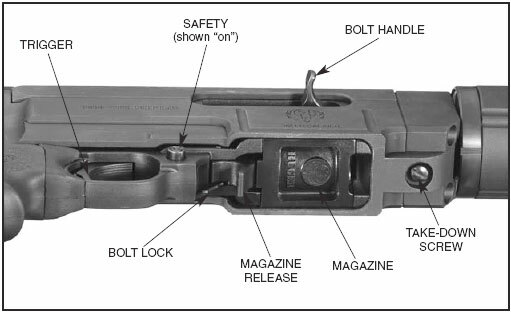 The SR-22 uses standard SR-22 rotary magazines. Indeed, at its heart, the SR-22 is pretty ordinary. It features a standard 10/22 action inside an aluminum Nordic Components chassis that provides the rail mount, buttstock mount, and AR-style grip mount. The SR-22 ships with a six-position, telescoping M4-style buttstock (on a Mil-Spec diameter tube), plus a Hogue pistol grip. Buttstocks and grips may be swapped out for any AR-style compatible option. The wobbly, collapsible buttstock is the first thing this editor would toss on the SR-22. Interestingly, the round handguard/float tube is secured with a standard-thread AR-style barrel nut, and the handguard is drilled and tapped for rails at the 3, 6, 9 and 12 o’ clock positions. Picatinny handguard rails are available from Ruger so you can add rail-mounted gizmos to your heart’s content. There is a barrel support V-block in the handguard so you can easily swap barrels or install after-market 10/22 barrels. The SR-22’s 16-1/8″ barrel is capped with an Mini-14 flash suppressor mounted with AR-spec ½”-28 thread. Share the post "Ruger Reveals New SR-22 — Rimfire AR Look-alike"
If you’re looking for the latest info on the upcoming SHOT Show, the NSSF now has a SHOT Show Blog with regular updates. The SHOT Show Blog currently explains how you can sign up for SHOT Show Webinars and SHOT Show University. In addition, you can learn about Media Day at the Range, which will be held Jan. 18, 2010 at the Boulder City Pistol & Rifle Range, outside Las Vegas. If you are planning to attend the 2010 SHOT Show, note that this year, SHOT Show will be held in the Sands Expo Center, located next to the Venetian Casino Resort in the heart of the Las Vegas Strip. Discounted lodging at a variety of nearby hotels and casinos is available through the SHOT Show Travel Desk. Share the post "NSSF Launches SHOT Show Blog"